I generally do not write about the movies I dislike, or the movies that fall below my level of expectation. But Tarzan being one of my favourite animated Disney movies, the prequel/sequel to the classic, seemed to me a little dull. Also, the other movie about a jungle boy, also released this year, was such a surprise, that the expectations from the second boy of the jungle was naturally high. And no question it’s Mowgli who comes out on top. So, The Legend of Tarzan, based on Edgar Rice Burrough’s literary classic, isn’t meant to be fun in the way that The Jungle Book is intended. Yet does the King of the Apes have to be this dour, this dull, this much of a cure for jetlag? Another dose of disappointment was from the director, David Yates, who directed the last four Harry Potter films beautifully, appears to have lost his magic touch while working this adventure. After Cristopher Nolan’s Batman Begins, there has been an upsurge for the dark and shadowy origin stories in almost all of the rebooted films. But the point one has to understand, is that reboots can be fun like The Jungle Book too! And this is precisely where The Legend of Tarzan falls short. Tarzan (a grim Alexander Skarsgard) is placed in a dark African jungle. The result is a film that’s bleached of most of the color from the original. A starry cast and hordes of CGI animals don’t elevate the proceedings much. The plot is quite familier, we get flashbacks as to how John Clayton III is raised as Tarzan amongst the apes and how he left for civilization with his love Jane (a spunky Margot Robbie). The film focuses on John’s return to the Congo to rescue his African brothers whose tribes are being enslaved by the Belgian king’s envoy Leon Rom (Christoph Waltz in a white suit but with a black heart). There are subplots involving diamonds, colonization and revenge, but despite this over-populated narrative, the film moves slower than a sloth. The one thing the film throughly lacks, despite all of it CGI tricks and physical showoffs, is the essence of bonding. There are almost no scenes of Tarzan bonding with the apes and vice-versa. 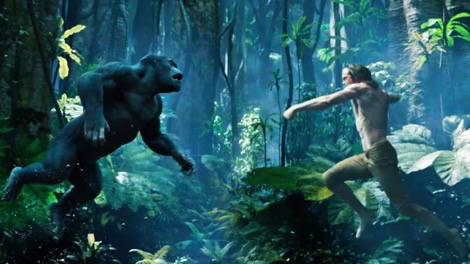 Though there is a scene where Tarzan goes head to head with his ‘ape brother’, which is pretty impressive. Skarsgard is up for the sheer physicality of his role, but looks too morose throughout and therefore one-note. The supporting actors are good, adding ocassional delight, but they are not enough to sustatin the film missing its true soul. I’m going with 2 out of 5 for The Legend of Tarzan. This is a pale, watered-down take on the iconic hero. Perhaps Tarzan was best left in the jungle. Published on July 28, 2016. Updated on July 27, 2016.